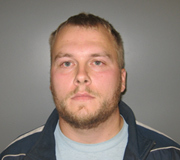 A school teacher in south-central Iowa is facing charges for having inappropriate contact with a student. Knoxville Police Chief Dan Losada says the allegations against 25-year-old Justin Mikels first surfaced in early October. He was arrested on Friday. “The investigation took as long as it did because, among other things, we subpoenaed cell phone records to try and confirm some of the allegations made by the student,” Losada said. Mikels was placed on paid administrative leave in October. He’s a teacher at the alternative high school in Knoxville and also helped coach football and baseball. Losada says the alleged contact between Mikels and the 16-year-old female student did not take place in the school. Mikels is charged with sexual exploitation by a school employee, an aggravated misdemeanor. He was released on bond and is scheduled to appear in court in early December. According to police, the student was not physically harmed and is still attending school.